Armando L. Sanchez | Chicago Tribune via AP. People sleep in tents near a wooded area adjacent to the Dan Ryan Expressway on Tuesday, Jan. 29. Officials throughout the region were focused on protecting vulnerable people from the cold. As Chicago hit record-low temperatures last week, a number of organizations in the city and the surrounding areas took extra measures to ensure the safety of homeless residents. Chicago was blitzed by a series of days marred by extreme cold weather, reaching a low of 23 degrees below zero on Wednesday, the fourth coldest recorded temperature in the city’s history. The below-freezing temperatures posed a particularly severe threat for the vulnerable approximate homeless population of 80,000 living in the city. Zakat Foundation of America is a Chicago-based nonprofit dedicated to helping less fortunate communities. On Wednesday and Thursday, members of the organization braved the cold to provide homeless residents with warm meals, water, blankets, coats, socks and other warm clothes. Haleem went on to say that by choosing to ignore the issues faced by the homeless, society as a whole is being weakened. On the suburban front, homeless shelter BEDS Plus utilized a pre-existing practice in which they drove those in need of shelter to their facilities free of charge. “We do regularly provide transportation to clients on an as-needed basis, which might include taking them to jobs, healthcare appointments, train and bus stations,” said Grant Suhs, Communication Specialist for BEDS Plus. Suhs stated that it is often very easy for people to disassociate themselves from the homeless, theorizing that it is easier to chalk their plight up to a perceived low moral character rather than issues that can befall anybody. In addition to shelters, citizens of the city took matters into their own hands to assist those braving the elements without a home. An unnamed Chicagoan paid for 70 homeless people to stay overnight in a hotel after a propane tank heating a tent city near the Dan Ryan Expressway exploded, according to CNN. Residents of the city took to social media to provide assistance to the homeless, posting lists of heating shelters in the city to Instagram. 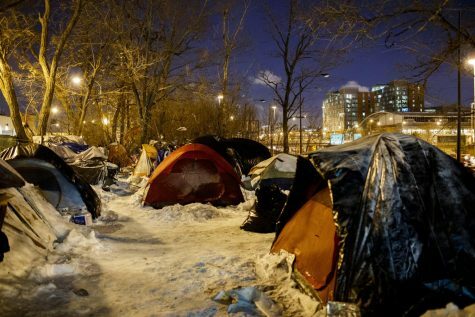 Chicago has a staggeringly large homeless population of approximately 80,384 people, according to 2016 data from Chicago Coalition for the Homeless. The issue of homelessness is one of great importance to the city, with some citing a lack of affordable housing in Chicago as a root cause. Hula emphasized the issue of homelessness as being year round, with action needed even without severe weather. Haleem stressed the point further, stating that helping the homeless can lead to a positive cycle of altruism.